Bluebirds are bedazzling creatures. This website was developed as a resource for people interested in helping bluebirds and other native cavity-nesters survive and thrive. See the Site Map (index) or Pulldown (Jump) Menu for an alphabetical list of topics covered. An Eastern Bluebird incubating her eggs. Photo by Bet Zimmerman. See larger version. : Floyd Van Ert | You know you're a bluebirder when... | Picture of the week | Video of the Month | FAQs | How does a bird embryo breathe inside the egg? | Is it safe to use nestboxes made from pressure-treated wood? | Cooperative Breeding and Feeding | Do babies return to the nest after fledging? | and a whole lot more. General Info: Basic information on how to attract nesting bluebirds, including do's and don'ts and a nesting timetable. A good starting point for beginners. Bottom Line Advice for new bluebirders. Top tips and tricks to attract bluebirds (proven and experimental.) Birdbaths. My theories on why we are so fascinated by bluebirds. Bluebird Emergencies - locate wildlife rehabber near you, what to do if you find an orphaned bird, baby bird on the ground, egg on the ground, or injured or sick bird. Flyers: A handout that can be given to people with a nestbox, or used by bluebird organizations (just add your logo.) The Bluebird Nut Cafe has also developed a general pamphlet that you can view or print for people who might be interested in putting up a nestbox/trail. Another handout is available for people who have birdhouses being used by House Sparrows. See other handouts here. Children's Bluebirdy Activities: Coloring pages, nursery rhyme, games (the wrong nestbox, compare the nestboxes, match birds with their nests, put bluebirds in sequence from egg to adult), a scavenger hunt, quilt patterns, origami, children's books on bluebirding, Native American story, Bird's Nest Parfait story, etc. Eggs: production, number of eggs laid, first egg, rotation, hatching, unhatched eggs, egg binding and calcium deficiency, weird eggs, egg sizes, comparison photos, nest and egg ID, white bluebird eggs, not all blue eggs are bluebird eggs. Feeding: Mealworms (with plans for a simple feeder), and suet recipes. How to raise your own mealworms. Supplementing calcium by offering crushed eggshells. Halo: Information on the Magic Halo developed by the University of Nebraska to deter House Sparrows from bird feeders. Heat: Experimental shields in Texas to protect nestlings from high temperatures. Birdbaths. History of Bluebirds and Bluebirding (Draft.) Take the bluebird history quiz to test your knowledge. Former scientific and common names. Bluebird postal stamps (U.S., Canada, Bermuda). Quotes related to bluebirds. Lyrics to "I Wish You Love." Review of various types of traps by Paula Ziebarth. An essay: Are HOSP Evil? Wall of Shame: Photos of commercial establishments with HOSP breeding and/or feeding at their facilities. Children's story about HOSP takeover of a nestbox. Landscaping for Bluebirds: List of non-invasive plants that produce berries eaten by bluebirds. Links and Resources: A comprehensive list of resources on bluebirds; links to information on identification, bluebird organizations, feeding, nestboxes, predators and parasites; and more. Reviews and sources of books on bluebirding and birding. ID chart with clues to Nest Contents | Egg Color, Shape, etc. How Many Eggs Will a Bird Lay? I found an egg, can I incubate it? How many broods will bluebirds have in a season? 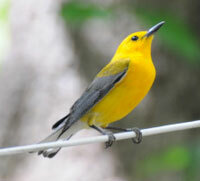 Prothonotary Warbler in breeding plumage. Photo by Robert Peak. 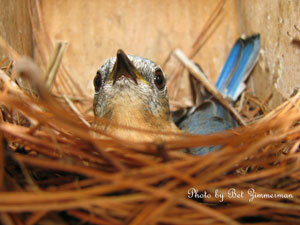 Tree Swallows: Biology, Photos, Picture of 2 different size nestlings in one nest. Tree Swallow adult photos. Also see Pairing Nestboxes and Kinney (four hole) TRES box design. Grid nestbox placement. Tufted and Black-crested Titmice. Interesting video clip of hissing titmouse. Photo album of cavity nesting adults, nests and eggs including Eastern, Mountain and Western Bluebirds. Links to other sites with albums. Unusual nest sites - metal poles, breaker boxes, etc. General information on a variety of topics like ants, blow flies, etc. House Wrens - deterring. Also see HOWR Biology, Video of Egg Attack, and Another Perspective. Suet Recipes: A collection of easy recipes that bluebirds and other birds will relish. Suppliers/Retailers: Links to sources of books, videos, mealworms, gifts, nestboxes, nestbox cameras, traps, etc. A list of nature-related gift ideas. Trails: All are located in northeastern CT.
A fourth trail in Roseland Park was "adopted" in 2008. A golf course trail across the street is only checked once a year. 2004: Trail Summary Report. Chimalis Trail Log. 2005: Trail Summary Report. Chimalis Trail Log. Landfill Trail Log. 2006: Trail Summary Report. Chimalis Trail Log. Landfill Trail Log. New Hill Trail. Best of Bluebird_L Classifieds: A separate website that captures postings from the Cornell Bluebird Listserv, categorized them by hundreds of topics. The archives contain a wealth of information from experienced bluebirders. Last updated January 19, 2018. Design by Chimalis.